A look at the issues that need to be addressed by design aiming towards achieving sustainability in the built environment. Duncan will introduce the issues illustrating it with green retrofit projects case studies from the current work of his award winning practice, BBM Sustainable Design, as it pursues an ethos of environmentally benign design in housing, commercial, as well as community and school buildings. The seminar will be open the doors to sustainable alternatives in construction. 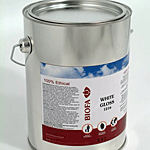 The focus will be on the ingredients found in paints and the reason for the use of these materials. Clay materials have been used in construction for as long as mankind has constructed dwellings. But are such materials durable? How do they impact on the environment? Can stringent levels of technical performance be achieved? Can they be beautiful? The presentation will identify a broad range of clay materials and examine their use in innovative sustainable construction projects. Materials will include unfired masonry such as earth bricks and blocks as well as fired products such as clay bricks, large format blocks and ceramic cladding systems. Alexis Harrison is a designer and specialist in the use of clay materials in architecture and currently works with leading architectural practices on exemplary construction projects for Arup Materials Consulting in London. Previously Alexis was Product Innovation Manager for Ibstock Brick where he was responsible for pushing the boundaries of clay materials into new markets for the firm such as innovative cladding systems, earth masonry products and modern methods of construction. Natural Earthen Finishes: Earthen plasters, paints, sculpting furniture etc. 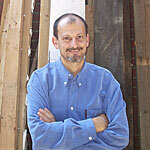 This talk will introduce the possibilities of working with earthen finishes. The subjects explored will range from sculpting your own furniture, to bread ovens, hot tubs and clay floors. We will also be looking at a variety of different clay mixes used for sculpting, plastering and making clay paints. Paulina Wojciechowska is an architect and author of the book Building with Earth, a guide to free-form Earthbag construction. She has worked on natural building projects in the USA, Mexico, and Poland. She has taught natural building workshops since 1998. The talk will cover the environmental refurbishment of a typical traditional Brighton solid wall Victorian terrace, which resulted in an improved energy rating of B from an E. The refurbishment included external wall insulation, highly insulated room in the roof, solar water heating, wood stove and high performance double glazing. Building performance and energy use has been monitored over the winter and compared to a similar un-renovated property. We will consider some of the design issues, material choices and resulting energy performance. Paul Early lives in Brighton and is an engineer with a Masters in Advanced Energy and Environmental Studies who has been involved with the promotion of green roofs and is currently producing calculation tools for determining the environmental impact for large infrastructure projects. Haysom Ward Miller Architects have a keen interest in sustainable and low energy design and the use of natural materials. We are members of the ‘Association of Environment Conscious Building’, have had buildings published in the Green Building Magazine and were runners up in the ‘Eco-house’ category of the 2006 Grand Design Magazine Awards. In this talk, Patrick Ward will describe how he has incorporated sustainable technologies into his own house, a substantially remodelled 1960s building, which is nearing completion on site in Orwell, Cambridgeshire. Technologies incorporated include high levels of insulation, ‘intelligent’ membranes, heat recovery, wood pellet boiler, solar water heating, passive heat gain and rainwater harvesting. Richard will talk about the setting up and development of one of the country’s most successful community businesses that started here in Brighton; the social enterprise that is helping to reduce construction waste, save resources and create jobs for local people. Richard started the award–winning Brighton & Hove Wood Recycling Project in 1998 and is now developing a network of similar social enterprises around the country. 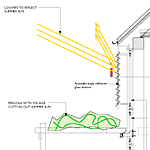 Specialising in guiding green architecture projects from the first idea to completion on site. Brighton-based independent financial advisors, specialising in ethical and environmental funds and financial planning. Designing and installing practical, secure bicycle parking that looks attractive. First bicycle-parking provider globally to manufacture products from recycled steel. Specialists for logs, wood chip and combination log and wood pellet burning boilers. For everyone with an interest in building green! 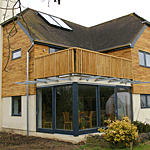 Developer of sustainable homes on the Isle of Wight. 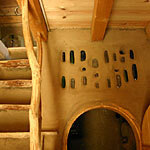 Earthships are fully sustainable buildings which require no mains services. Earthships Europe is developing the European model and can offer a design and build service. Design, installation and repair of solar thermal systems for hot water and swimming pools, central heating and with wood burning stoves. Substantial grants available. Specialising in making buildings more sustainable and efficient through designing with low embodied energy, thermal bridging and increasing passive solar gains in mind. A dynamic exploration of an everyday material; old newspaper. 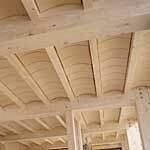 How can it be reused to become something precious and once again relevant to its native surroundings? Specialists in installing and providing information on solar power. Supplier and installer of solar products. Specialising in Solar Hot Water Systems for domestic properties. Provide information on grants available and general information on sustainability for housing and council work policies.